One year later, Arizona is back on top. In a wild worst-to-first season, the D-backs are riding a nine-game winning streak, and sit atop the division with a six-game lead over the defending world champion Giants. Friday (7 p.m., FOX Sports Arizona): Left-hander Joe Saunders (9-11, 3.82 ERA) will take the mound against Matt Cain (10-9, 2.87 ERA). Saturday (6 p.m., FOX Sports Arizona Plus): Ian Kennedy (17-4, 3.03 ERA) is slated to pitch, and will be opposed by two-time Cy Young award winner Tim Lincecum (12-11, 2.58 ERA). Sunday (1 p.m., FOX Sports Arizona): Right-hander Daniel Hudson (14-9, 3.61 ERA) is expected to toe the rubber in the series finale against Ryan Vogelsong (10-5, 2.63). 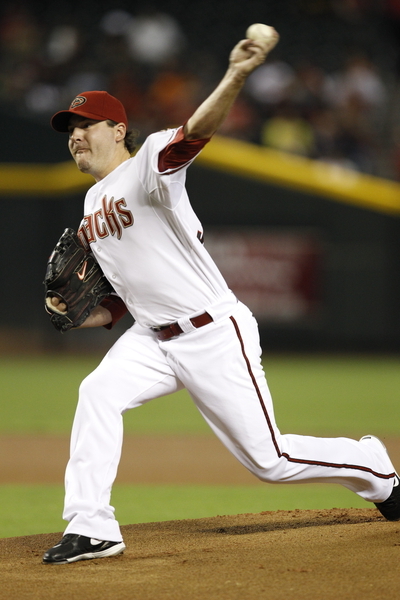 The D-backs own a 36-33 record on the road this season and are fresh off a 19-10 mark in August. Arizona started last month off with a bang by taking two out of three at AT&T Park. Kennedy delivered eight solid innings en route to a 5-2 win. One night later, it was Hudson who outdueled Lincecum by tossing eight innings of one-run baseball.